As you are most likely already aware, CME is changing their market data fee structure which will dramatically increase market data fees for “black-box” users of market data. This affects market data on CME, GLOBEX, NYMEX, and ECBOT. This is just a heads-up of what’s coming. More information will be sent in the upcoming days and weeks. If you are still using an old version of TWS, you need to upgrade to version 940 or above to use the API. When you are installing TWS, you will be asked if you want to bypass the precautions for orders. You should answer yes. If you answered no, your orders will not be transmitted. You can still fix this by going to the Configure menu in TWS, click API, click Precautions, then check everything. If you are trading these 2 symbols, you need to set the exchange to ARCA instead of SMART to be able to get data into BT. Thanks to Chuck G. for this finding. If you encounter this message while running BT, it could be one of 2 problems. The first one is the DEP problem – discussed here – so I won’t discuss it anymore. The second problem is the presence of old API versions and components lingering in your system. IB made several upgrades to their API and when you install a new one, the old versions are left behind. When an updated BT runs, it will still connect to the old components. BT does not package it’s own API (like some other programs) but depends on the original API’s from IB. The way to solve this is to uninstall the API through the Control Panel. The program should be labelled TWS_API. You can also check your C:\ folder to see if there is something like an IB_API_968 folder. If there is, go inside the folder and click unwise.exe to uninstall the program. You might also uninstall the Visual C++ 2005 redistributable through the Control Panel. When you install back the programs – get them from the BT download site – then install the programs in sequence. If you are getting a type mismatch error when you run BT, you might try changing your decimal point to period instead of comma. The latest API requires the currency information to be able to process the symbols. Previous versions of BT just leave out the currency information. With the new API, if the currency information is blank, it defaults automatically to USD, which causes problems with European and Asian exchanges. The latest version of BT (2013r13 and up) contains modifications to the symbol format sent to IB. You still have to update manually by clicking Reset to Default Symbols in the Tools menu to use the new format. 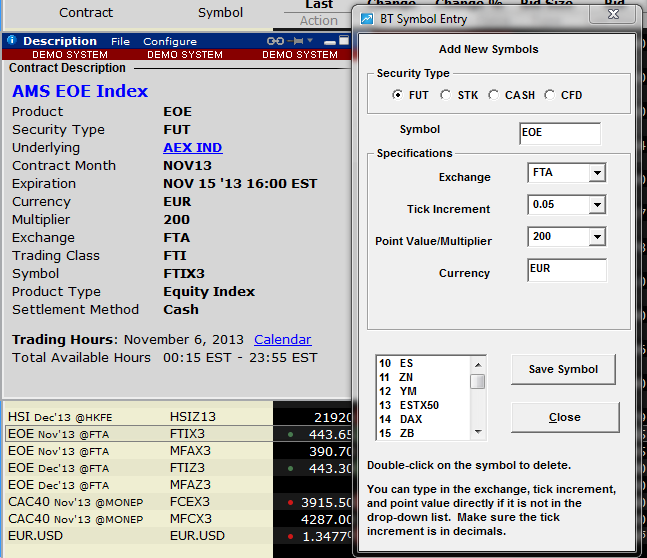 The latest BT (2013r13) was modified to allow trading mini contracts for the same symbol. The included symbols now default to the mini contracts. To trade the full contracts, you need to go to the Add/Delete Symbols option in the Tools menu, delete the default symbol by double-clicking it, then re-add the symbol with the parameters for the full contract. IB is always updating their TWS or API, which is both a good thing and a bad thing. The good part is that bugs will be fixed, new features will be added and functions will be more streamlined. The bad thing is that since we are used to the “bugs” or idiosyncrasies in the old versions and have workarounds for them, any updates will break the current versions. The latest, most noticeable change (since API 9.69) is that the API is now installed using an msi file into a separate “TWS API” folder, not under the old c:/jts folder. A lot of time and effort has to be spent to keep up with IB’s updates so we can use the new “features” which are required for specific situations.